The Dark Knight Rises is the highly anticipated conclusion to the successful Dark Knight saga, directed by renowned filmmaker Christopher Nolan. I feel it would only be appropriate to begin this review by stating my personal opinion on the prior installments to the series. 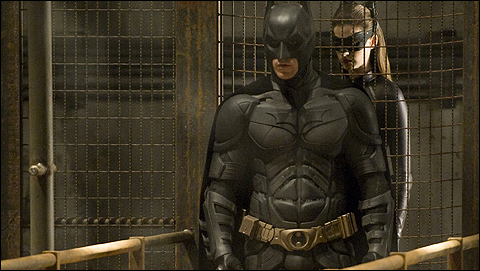 I enjoyed Batman Begins, and found it a pretty good movie, albeit also quite flawed in various areas as well. While The Dark Knight corrected many of Begins’ missteps, and has made its own well-earned stamp in film history, I do not hold it to as high of regards as many of its fans do. In the months building up to the film’s release, I often found myself debating my friends on what the quality ultimately would be of this movie – I didn’t have as much confidence in it as they did. And still now, even months after having seen it for the first time, we still stand on opposite spectrums, holding to our same stances. Eight years after the events of The Dark Knight, Gotham is experiencing an unprecedented period of peace due to the “Harvey Dent Act” making it easier to prosecute criminals and deny them parole. However, this is also apparently a time of unrest with Gotham City’s lest fortunate, though this subplot doesn’t receive as much screen time as you’d assume. Bruce Wayne (Christian Bale) has retired from his short-lived career as the Batman due to a crippling depression brought on by Rachel’s death in the previous film (a subplot that is quickly disregarded as he finds new, even more forced love interests), and also due to more physical crippling injuries (presumably attained from the fall at the end of The Dark Knight, though this is also eventually hand-waved for the sake of the plot). Things take a turn for the worse when a mercenary infamously known as “Bane” (Tom Hardy) makes his presence known, soon taking over Gotham and sealing it off from the outside world (through admittedly contrived means). Combining this with the arrival of skilled burglar Catwoman (Anne Hathaway), Bruce dawns the cowl once more to protect his city. As the previous paragraph implied, the writing here is evidently not as tight as in the previous movies. Nolan strived to create an “epic” film, and that’s what he does. Unfortunately, he falters under the weight of the movie and his own ambition, creating loose ends, unsatisfactory conclusions, plot holes, and awkward pacing and contrivances. All of the pieces were set quite well, and in a lot of ways, this film is everything that it needed to be, but ultimately, it was not what the fans deserved. However, having said all of this, the film isn’t wholly bad. As I said, Nolan does succeed in creating an epic conclusion. The characters’ are memorable; the action, while not amazingly choreographed (though immensely better filmed) is still enjoyable to watch; and there is a visceral satisfaction you get from the movie. Though the film's theme's resolution may not have been executed as well as it could have been, it still is satisfactory to see your favorite characters finally attain the peace that they have endured so hard for. The Dark Knight Rises is imperfect, and depending on your mindset, quite poor, but the grandness of this story and the ardor that went into its creation are undeniable.